POSSIBLY THE BEST LOCATION IN NERJA ! JUNE /AUGUST offers. Pool - Wifi- Air con. Beach below and a short stroll to famous Balcon de Europa. Parking close by. **Possibly the best location in Nerja. the famous Carabeo to the heart of Nerja and the Balcon de Europa. ** March 2020 long let still available. 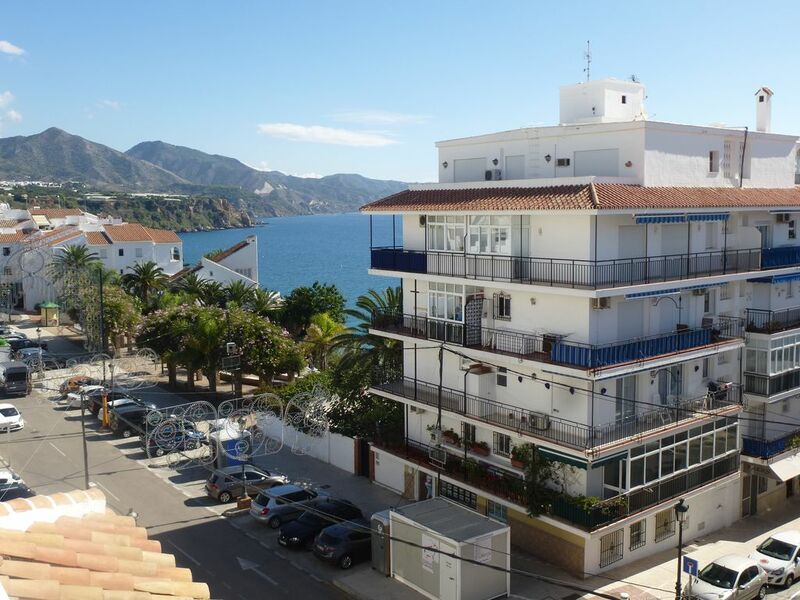 Refurbished to a high standard, our 1 bedroom apartment is ideally situated in a prime position in the highly sought after eastern side of Nerja, close to the Parador. The apartment has a double bedroom with air con and a bathroom with full suite. The kitchen is newly refurbished and fitted with quality appliances and granite worktops including large size fridge-freezer, microwave, toaster, kettle, full size oven/hob plus dishwasher and washing machine. The lounge is modern, bright and airey, decorated in relaxing, neutral tones. It has a wall mounted flat screen TV with many English channels and a bed setee. There's a dining area seating four. The large corner balcony is accessed by patio doors from both the bedroom and sitting room. From one side there is a side sea view, and from the other side a view of the Sierra Almijara mountains, Nerja's stunning backdrop. The secluded communal pool and grassy sunbathing area overlook the breathtakingly beautiful Carabeo beach directly below, with views extending over the Med. Perfect for a romantic getaway in the heart of Nerja.The apartment has had airconditioning fitted in the lounge and bedroom and is included in the price. Small supplement for wifi. We offer excellent long let rates. For bookings of 4 weeks or more electricity is not included. This is charged at cost. Parking: On street parking is available outside the apartment free. This is on a first come first served basis. There is also a large pay car park a 1 minute walk away. Car hire isn't necessary for getting around Nerja due to the apartment's excellent central location, so you may prefer to opt for private airport transfers instead. Please enquire for details. PLEASE NOTE- Electricity is charged at cost for lets of 4 or more weeks. The apartment is for up to 2 people. Extra guests can be accommodated on the sofa bed at £50 per person per week. Luxury house: Our other property in Nerja: We also have a larger property available in Nerja, a luxury 1 /2 or 3 bedroom house with lots of outdoor space and great views . We are flexible with change over days in the house. I love Nerja. So will you !! Nerja really does have something for everyone. It is perfectly situated in the older more traditional side of Nerja. Perfect location in a small well kept block. Nice bright bathroom with a bath and shower over. Situated in an excellent location in the beautiful resort of Nerja. Elevator/lift Several extra services/facilites can be arranged for our guests in order to make your holiday as easy and stress-free as possible. These include private airport transfers, baby equipment hire, beach towel hire, optional cleaning during your stay, grocery shopping service (Choose which items you'd like from an extensive list and your groceries will be ready and waiting for you on arrival), flowers for special occasions, and luggage storage. Please enquire for costs. The apartment was spotlessly clean, well equipped and in the perfect location.Lisa, who looks after it was very helpful and efficient and arranged transport to the airport for us..I would highly recommend it. Great apartment in a fantastic location. . Absolutely loved nerja! Apartment was really well situated, beautifully decorated and well equipped. Only downside was the lack of a sun lounger in the apartment as there were none around the shared pool. We loved walking around the town especially the old town. There was plenty of choice of vegetarian food available which is always a bonus. Would definitely recommend nerja to friends and family. Great place!! May well come back in the future. Perfectly situated in the older, more traditional quarter of Nerja, the apartment building overlooks the beach. It's only a 5 minute walk from the Balcon de Europa, Nerja's focal point. The maze of narrow streets in the old town, where you'll find numerous tapas bars tucked away, is just a couple of minutes walk away, and many of the town's finest restaurants are practically on the doorstep of the apartment. mark the border of the Malaga and Granada provinces. These mountains, mostly designated as national parks, can be explored on foot. The caves at Maro (5km from Nerja) provide a convenient starting point for some popular walks, and the caves themselves must not be missed. Nerja is also a great base from which to explore nearby cities such as Granada, Malaga and Seville, as well as the countless, idyllic mountain villages close by. Golf: Baviera Golf at Caleta de Velez is only a 20 min drive away. Ski: The Sierra Nevada ski resort near Granada is less than 2 hours drive away. Usually open from mid-November to mid-April it's very reasonably priced compared to other European ski resorts. The rates above are for the rental of the whole apartment for 2 people. For lets of 10 nights or more a second set of bedding/towels is left in the apartment for you.